A growing share of Americans are reading e-books on tablets and smartphones rather than dedicated e-readers, but print books remain much more popular than books in digital formats. Americans today have an enormous variety of content available to them at any time of day, and this material is available in a number of formats and through a range of digitally connected devices. Yet even as the number of ways people spend their time has expanded, a Pew Research Center survey finds that the share of Americans who have read a book in the last 12 months (73%) has remained largely unchanged since 2012. And when people reach for a book, it is much more likely to be a traditional print book than a digital product. 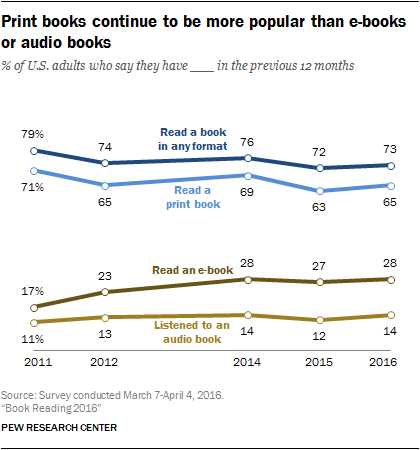 Fully 65% of Americans have read a print book in the last year, more than double the share that has read an e-book (28%) and more than four times the share that has consumed book content via audio book (14%). But while print remains at the center of the book-reading landscape as a whole, there has been a distinct shift in the e-book landscape over the last five years. Americans increasingly turn to multipurpose devices such as smartphones and tablet computers – rather than dedicated e-readers – when they engage with e-book content. The share of e-book readers on tablets has more than tripled since 2011 and the number of readers on phones has more than doubled over that time, while the share reading on e-book reading devices has not changed. And smartphones are playing an especially prominent role in the e-reading habits of certain demographic groups, such as non-whites and those who have not attended college. These are among the main findings of a nationally representative telephone survey of 1,520 American adults conducted March 7-April 4, 2016. Following a slight overall decline in book readership between 2011 and 2012, the share of American adults who read books in any format has remained largely unchanged over the last four years. Some 73% of Americans report that they have read at least one book in the last year. That is nearly identical to the 74% who reported doing so in a survey conducted in 2012, although lower than the 79% who reported doing so in 2011. Americans read an average (mean) of 12 books per year, while the typical (median) American has read 4 books in the last 12 months. Each of these figures is largely unchanged since 2011, when Pew Research Center first began conducting surveys of Americans’ book reading habits (for additional details on the number of books read per year by different demographic groups, see Appendix A).